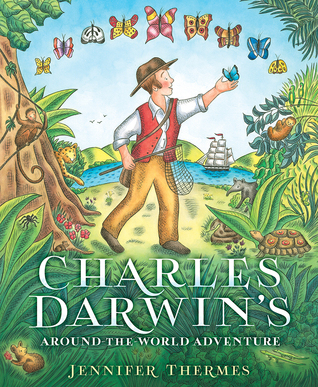 Today I'm taking part in the Charles Darwin's Around-the-World-Adventure blog tour. I am also giving away a copy of the book to one lucky reader thanks to the generosity of Abrams Books for Young Readers. Complete the form at the bottom of this post to enter the giveaway. Jennifer Thermes highlights Charles Darwin's five year expedition on the Beagle in Charles Darwin's Around-the-World Adventure. Upon opening the cover, it's evident that the book is full of kid appeal. Readers will first notice a timeline and a hand-drawn and painted map on the endpapers. After briefly describing Darwin as a child, the focus of the story shifts to his work on the ninety-foot ship, the Beagle. Darwin was hired as a naturalist on board the ship that sailed around South America. Lush watercolor illustrations feature plants and animals that Darwin encountered on the voyage. Readers will especially like the cross-section of the Beagle which shows the insides of cabins and storage areas. Colorful, full-page maps are placed throughout the book to provide context to the story. Illustrations of animals and insects are included on each map. Thermes keeps the story focused on what Darwin learned on the expedition, but she also adds interesting details throughout the story. "He saw a rare bird called a rhea that used its wings to steer as it ran, but could not fly. He discovered that some creatures were good for eating. Roasted armadillo made a tasty breakfast." Thermes provides readers with more information about Darwin's work and The Origin of Species in the "Notes" section in the back of the book. Children will also be interested in the two-page spread of "Fun Facts" with accompanying illustrations. Did you know the Beagle had its own library with "almost four hundred books"? After reading Charles Darwin's Around-the-World Adventure, young naturalists may be inspired to create their own nature journals. Readers may also find themselves more aware of the insects, plants and animals in their own backyards.